Download the urban planner's guide to city resilience. Discover the tools you need to quickly align the typically disparate land use, zoning, and hazard datasets. Distill actionable insights for resilience, climate adaptation, and recovery planning. Learn iterative scenario planning strategies to better understand future plan impacts and find equitable, sustainable, and resilient options for your project or community. View the case studies for seven cities across the U.S.
Read how to efficiently develop holistic resilience analyses that consider a wide range of factors, including emissions, transit accessibility, household costs, and more. The UrbanFootprint software platform allows you to spend more planning and less time wrestling with outdated GIS tools. By streamlining the often time-consuming and costly processes of data acquisition and analyses, UrbanFootprint helps planners focus on what truly matters - building sustainable, resilient, and equitable communities. Examine Seven Resilience Planning Case Studies. Grounded in more than 20 years of innovation by leading urban planners Peter Calthorpe and Joe DiStefano, UrbanFootprint is designed to help planners get the tools and information they need to build more sustainable and equitable cities. In this eBook we'll walk through resilience planning case studies for seven cities across the U.S., including the potential sea level rise in Tampa, Florida, flood hazard areas in Topeka, Kansas, and wildfire recovery in Sonoma County, California. Download the eBook today to learn more. 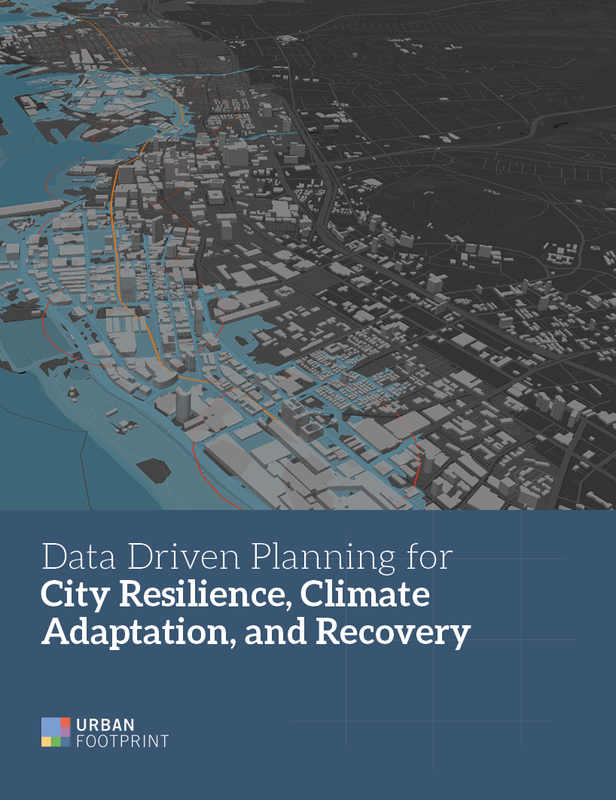 Download "Data-Driven Planning for City Resilience, Climate Adaptation and Recovery" Today. Scientists agree: If we are to curb the effects of climate change, we need to dramatically reduce global emissions. In addition to the ongoing and incredibly important work of planning for sustainable, equitable, and economically strong communities, planners must now simultaneously tackle the impacts of climate change and natural hazards to ensure the design of safe, resilient cities. Learn the data-driven planning strategies you need to build a resilient future for both people and planet. Download our new eBook today to get started. Discover the latest strategies for data-driven, city resilience planning. © Copyrights 2018 All Rights Reserved by UrbanFootprint.